In 2010, photographer Dietmar Eckell was the general manager for Southeast Asia at a German Fortune 500 company, working and living comfortably. But, since his childhood, Eckell says he’s felt the strong pull of “wanderlust,” so that year he resigned his post and began travelling the world, documenting abandoned and decaying relics of earlier times. Since then, he’s traveled almost 75,000 miles and visited four continents. 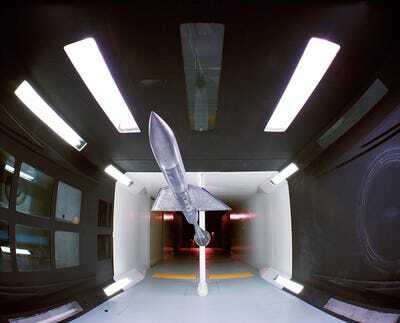 “I haven’t regretted it for one day,” Eckell tells Business Insider. 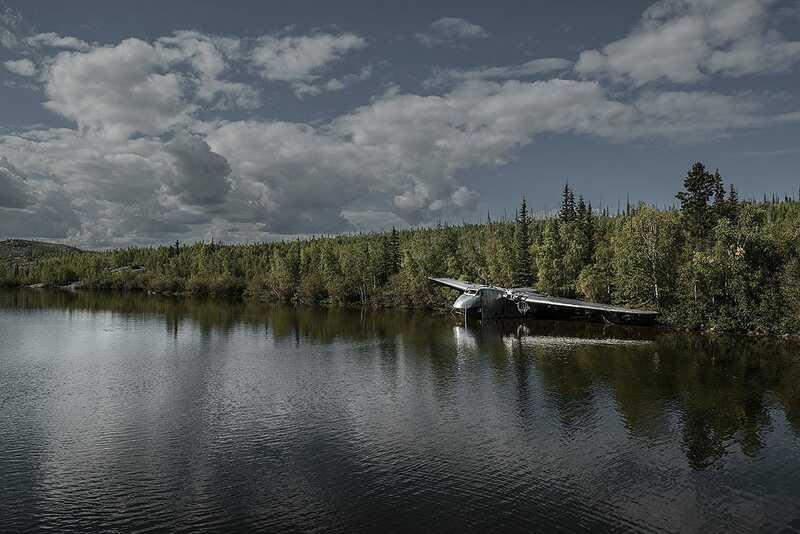 Acting as part detective, part explorer, and part artist, Eckell traveled by any means necessary to some of the most remote areas of the world, tracking down these abandoned planes, many of which were difficult to locate. “It’s just a great feeling to finally sit on the wing of a plane that you’ve been trying to reach for years,” he says. Eckell has shared some of his photos here with us. For the full story on many of the planes he visited, we suggest you buy his beautiful new book. Douglas C-47, part of the Royal Canadian Air Force. Crashed near Snag, Yukon, Canada, in 1950. All 6 survived. Eckell had no exact location for the C-47 when he arrived in Snag, Canada. After speaking with the locals, he secured a flight with a friendly pilot who flew him over the wreckage. Later, Eckell attempted to reach the plane on the ground, but that proved treacherous as the land around the wreck was very swampy. Travelling by ATV, 'we had to pull each other out with the trench every five minutes and maybe made one mile per hour,' he says. Finally, he arrived at the wreck and documented what was left before the whole thing eventually sinks into the bog. Grumman HU-16 Albatross. Suspected drug-running plane. 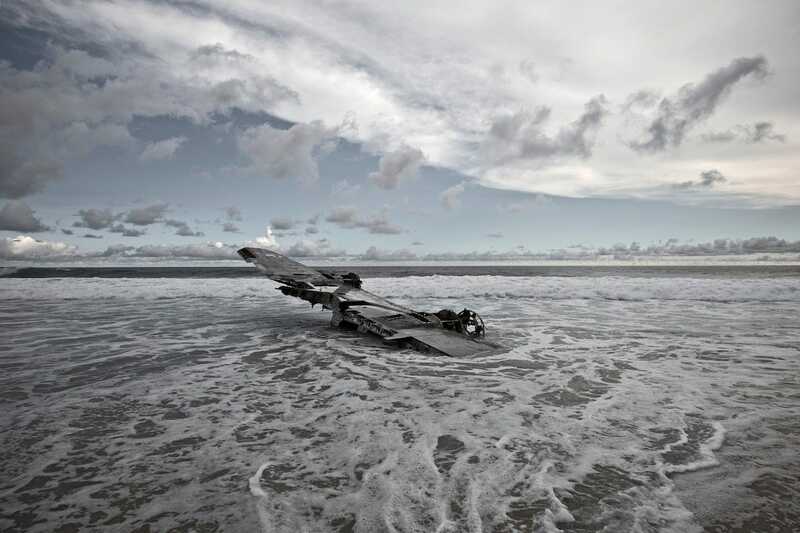 Crashed near Puerto Escondido, Mexico, in 2004. All survived. Eckell had heard rumours of a 'mysterious drug plane' on a remote beach in Mexico, so when found a cheap flight to Ixtapa, he jumped on the opportunity. Upon landing, he rented a car and traveled 45o miles to Puerto Escondido. The locals told him that after the crash, the survivors carried as much cocaine as they could from the wreckage, but were subsequently eaten by crocodiles in the lagoons nearby. Eckell isn't sure if he believes this. Avro Shackleton. 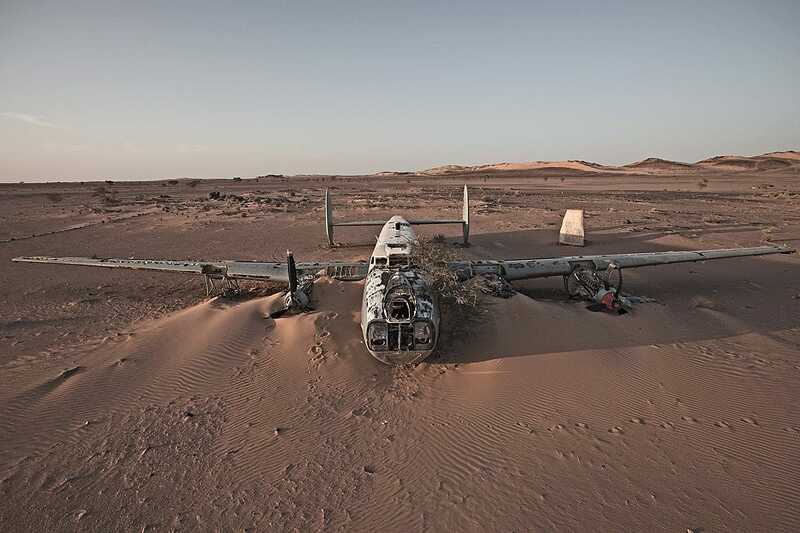 Crashed in Polisario-controlled area of the Western Sahara in 1994. 19 survived. Eckell found this wreck in the 'no-man's land' between Morocco and Mauritania. After days of travel, including 26 hours of non-stop driving and 20 hours on Mauritania's famous iron ore train, he finally arrived at the Avro Shackleton in a remote desert setting. He stood on the roof of his car and held his tripod above his head to get the shot, before making the treacherous drive home. Curtiss C-46 Commando. 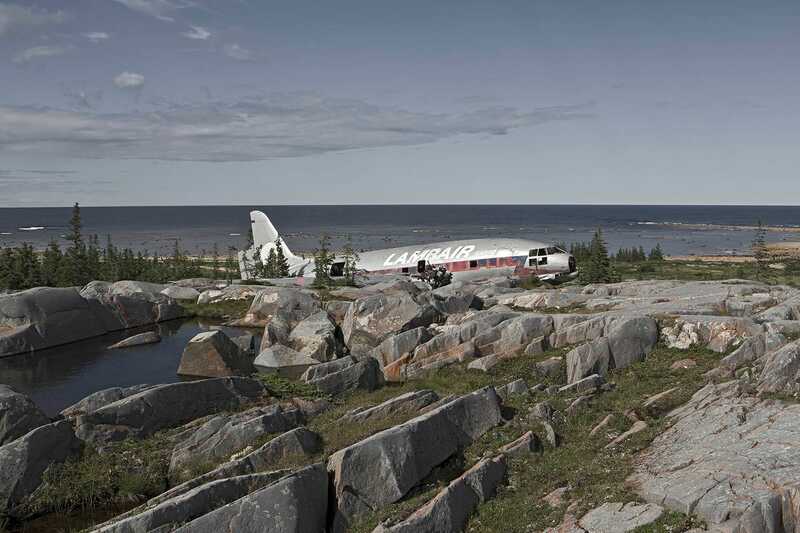 Crashed near Churchill, Manitoba, Canada in 1979. All three survived. While Eckell says this wreck is fairly easy to get to, 'it's not a good idea to walk out to the wreck -- this is polar bear country and they are hungry in the summer because they haven't eaten anything since the ice melted,' he says. This specific trip was one of Eckell's most costly. He lost a drone with a camera and memory card when it malfunctioned and flew off uncontrolled into the bush. Later, he fell into a whole, breaking his fibula. Still, he got the shots. Douglas R4D8. 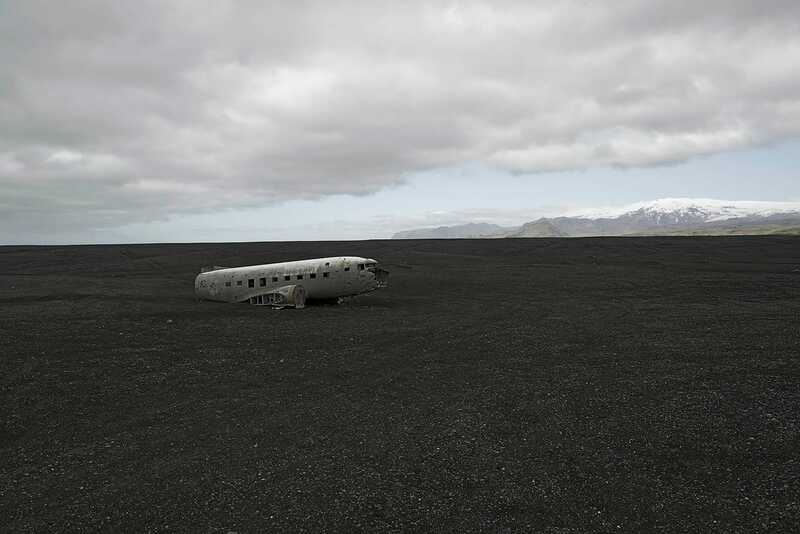 Crashed near Vik, Iceland in 1973. All survived. This wreck is found on the lava sands only two miles from a main road, about a two-and -a-half-hour drive from Reykjavik, Iceland's capital. Eckell took this photograph during June, when Iceland experiences 24 hours of daylight. This photo was taken at midnight. 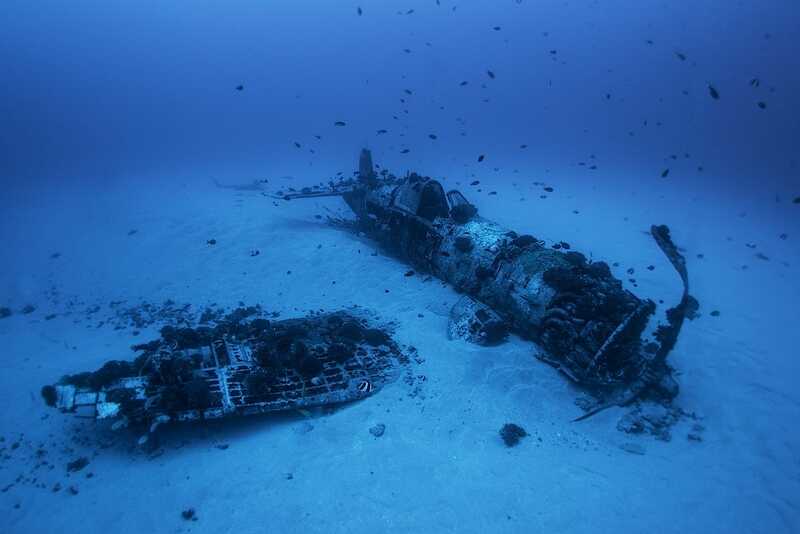 Eckell found this aeroplane off the coast of Hawaii, about 30 meters below the surface. Equipped with a diving instructor, heavy-duty waterproof casing for his camera, and underwater flash bulbs, he braved strong currents to get this picture. The diving guide mentioned to Eckell that the pilot of the plane, the only person aboard when it crashed, is still alive and living in Hawaii. Bristol 170 Freighter, part of the Pacific Western Airlines fleet. Crashed in Beaver Lodge Lake, Northwest Territories, Canada, in 1956. All three aboard survived. 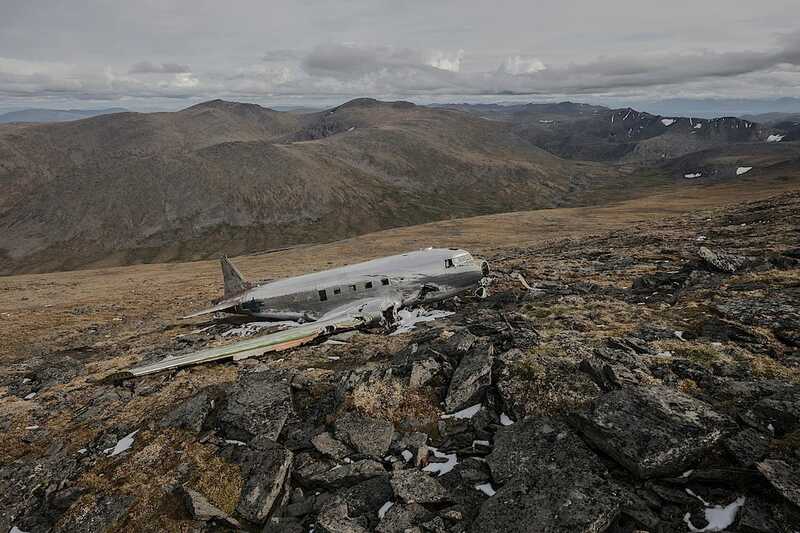 After landing in Fairbanks, Alaska, Eckell rented a Toyota Rav4 and spent the next ten days driving and sleeping in the vehicle, on his long drive to the remote area where this plane crashed. He searched for days for a floatplane operator to take him to the spot until he found one who landed on the lake and paddled the boat around while Eckell gave directions, trying to get the best angle for the shot. Cessna 310Q, part of the Goldmine Air Services fleet. 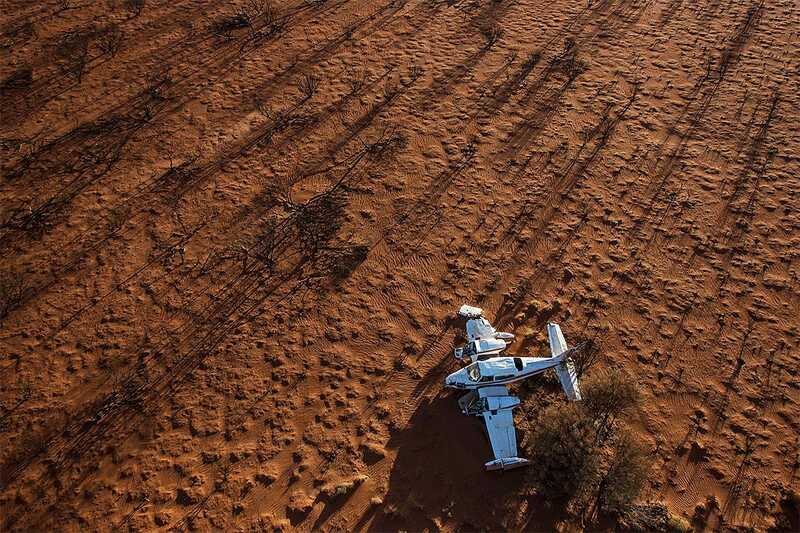 Crashed in the Victorian Desert, Australia, in 1993. All four crew members survived. After arriving in the small mining town of Laverton, Australia, Eckell informed the local police force that if he was not back in five days, they should come searching for him. He then set off down the remote Anne Beadell Highway, a barely used stretch of track that cuts into the western Australian desert. After following homemade signs pointing to the plane and getting caught in a dust storm, Eckell got the shot early the next morning, using a drone camera. US Air Force Douglas C-47. Crashed near Haines Junction, Yukon, Canada in 1950. All ten aboard survived. Eckell says this wreck is in a relatively popular area for tourists, yet almost no one knows about the plane. After 64 years, the plane is still in (relatively) excellent condition. 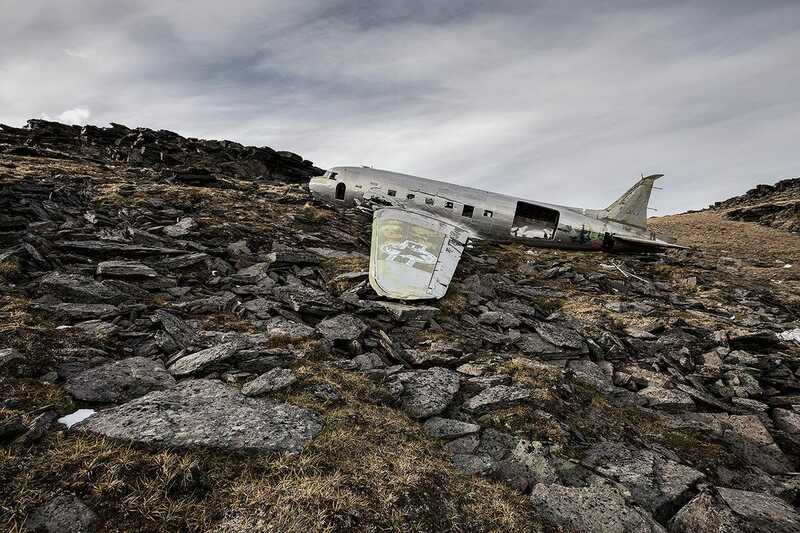 When the plane crashed in February of 1950, temperatures were -40 degrees Farenheit on the mountain. 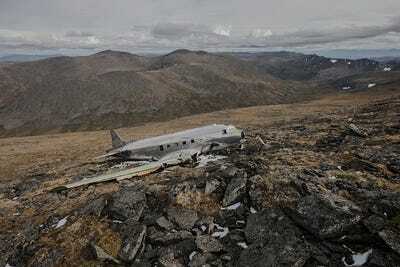 The pilot then walked down the mountain, through extreme terrain to a highway where he flagged a truck down. He then led a search party back to the wreck, and all crew members survived. US Airforce B-24D Liberator. 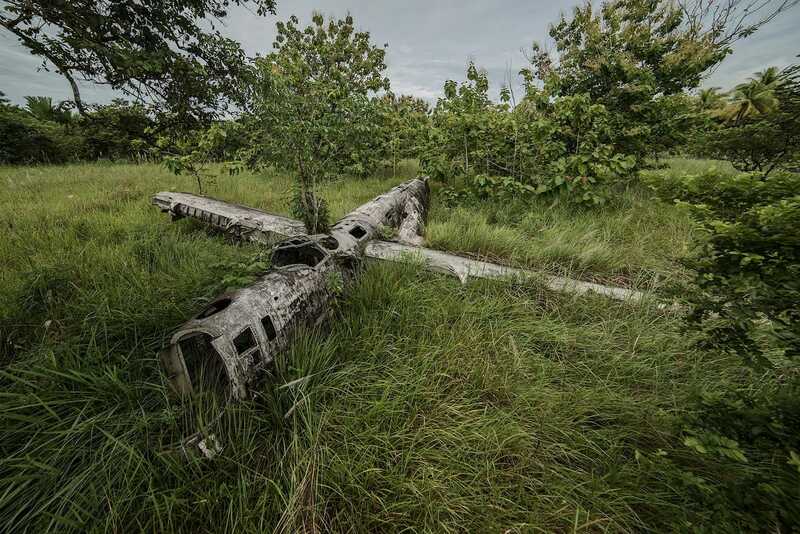 Crashed near Gona, Papua New Guinea, in 1943. All nine crew members survived. In 2013, after a destination wedding in Manilla, Eckell hoped a flight to Papua New Guinea. He hired a guide who took him to the remote town of Gona, where they asked everyone in town about the aeroplane, miming an aeroplane crash with their arms. One person knew, and led them down a long beach. 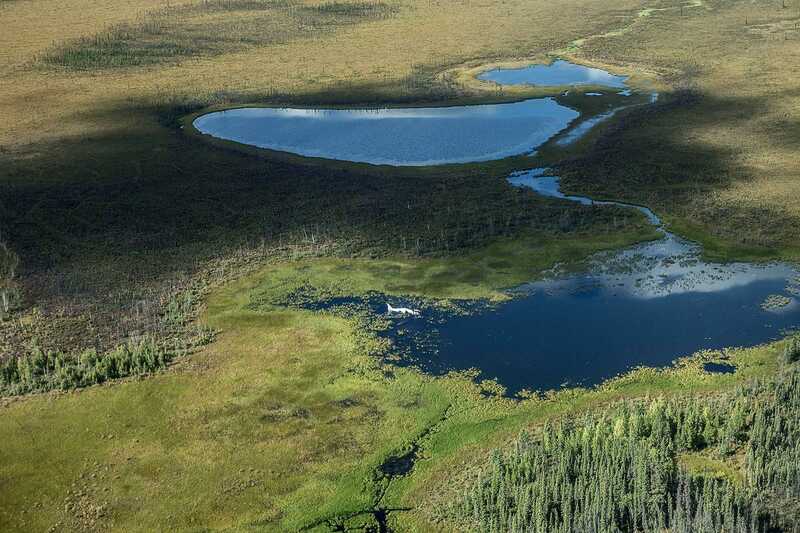 'We passed villages with no water or electricity and people fishing in dug-out canoes -- it was like a time travel... out here they live like 70 years ago when the plane landed,' Eckell says. When they arrived, the group had to hide under the Liberator's wing as a heavy rainstorm passed through. Eckell then climbed a tree to get a better shot and was attacked by giant ants.